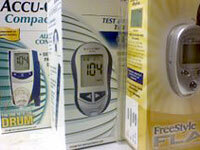 Test strips are sold separately from glucose monitors and can be pricey. Blood glucose monitors are devices—about the size of a cell phone or smaller—that are used to monitor your blood sugar at home. Although they can be mistaken for the latest fancy digital device, these gadgets come with lancets, which are used to poke the finger, and test strips, which is where you place the drop of blood before inserting it into the monitor to get a blood-sugar reading. They range in price from $20 to $70, but are often given away for free by various health-care providers. Companies can afford to give the monitors away for free because they make their money from the glucose strips, which can be pricey—$1 or more per strip. If you check your blood sugar as often as you should, you can easily spend more than $100 a month. The vast majority of your cost will come from glucose strips. So when choosing your device, you should pay attention to the cost of the strips, even if the monitor is free. You may need to select a specific blood glucose monitor because that's what your insurance plan covers. Edith Sciamanna, 79, of Binghamton, N.Y. has the Accu-Chek Advantage for just that reason. "I'm quite satisfied with it," she says. Are multisite: This means you can prick yourself not only on the finger but also on the upper arm, forearm, thigh, calf, or fleshy part of the hand. Require smaller samples of blood: The lancet doesn't poke the skin as deeply. Give results in as little as five seconds: This feature is particularly handy if you think you're experiencing hypoglycemia. If blood sugar is dangerously low, you need to find out fast and consume glucose to counteract it. Have more memory: Some record as few as 10 previous tests; others can keep a record of the 500 previous tests. Are smaller and more portable than others: If you're not into big purses, your blood sugar monitor's size might matter. Good news—today's units are much smaller than in the past. Models like the FreeStyle Lite and the OneTouch UltraMini fit into a slim pocket. Come with software: Although most glucose monitors can store results in their memory, some devices will also sync with your computer. Downloading your data may make it easier to share your readings with your physician and track your blood sugars over many months. You'll also be able to back up your data in the event you lose your monitor. If you're computer-challenged or prefer to keep track of your readings manually, you can skip this feature. Are geared towards those with low vision: Larger readouts make it easier for people with vision problems to see the results. Are easier to use: Because you may not always be checking your blood sugar under ideal conditions, it's important to consider the design of the model and its strips. Some models feed their strips from an internal drum (Accu-Chek Compact Plus) or disc (Ascensia Breeze 2); others have to be inserted into a small slot, a challenge at 4 a.m. when your blood sugar is low and your hands are shaking. The OneTouch Basic Meter is not multisite, requires 10 microliters of blood, gives readings in 45 seconds, has a 75-test memory, and comes with software. Cost is $70; $110 for 100 strips. Accu-Chek Active requires one microliter of blood, gives a reading in five seconds, and can store up to 200 test results. Cost is about $20; $30 for 50 strips. Accu-Chek Aviva requires 0.6 microliters of blood, renders results in five seconds, and has a memory for 500 previous tests. Cost is $73; $98 for 100 strips. The Ascensia Breeze 2 meter is multisite, requires 2.5 to 3.5 microliters of blood, provides readings in five seconds, can store up to 420 tests, and comes with software. Cost is $33; $90 for 100 strips. The Freestyle Freedom Meter requires the least amount of blood (0.3 microliters), is small, gives results in five seconds, and stores 250 previous tests. Cost is about $28; $97 for 100 strips. Medtronic Guardian RT is a continuous monitoring system (a small sensor that is inserted under the skin and sends readings every five minutes to a monitor). Cost is $1,339 ($35 additional for the sensor). Other continuous monitors include the DexCom Seven System ($800 for the basic system and $240 for a package of four sensors) and the Abbott FreeStyle Navigator, which was approved by the FDA in March 2008. Most insurance plans do not cover continuous monitoring systems.